In the course of your business operations you may find yourself trying to figure out a solution for how to shuttle your employees from point A to B in an easy and cost-effective way. Here at Switzer-Carty Transportation we have the perfect solution! Using school buses as employee shuttles is a great option for companies of any size. With many different sizes available, we have buses to suit all of your needs. 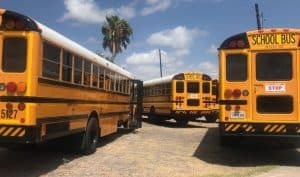 Whether you want to ensure all employees make it to the start of shift on time, you need to reduce vehicles in the parking lot, or you have to restrict vehicles allowed on site, school buses are the perfect way to provide transportation without racking up the costs commonly associated with shuttles. From ongoing needs to seasonal support, we’re here to help! School buses are the perfect way to move employees around, and you may not have even realized this was an option! Here are a few reasons you might want to use a school bus as an employee shuttle. If your workplace has an influx of employees during certain seasons, you may not have the parking lot infrastructure to handle the increase of vehicles. Have your staff park in a central location and bus them to the work site. When your work site is located far from where the majority of your staff live, you may have difficulties convincing them to make the long drive everyday. Offer them the ability to take a school bus to work to save them the drive time and wear on their vehicle. Your work site may be located on a large property or have multiple parking lots, making the walk from the car to the unit a long one. You can simplify the movement of your staff around site by having a bus at the ready to transport them to or from their vehicle. Does your staff need to move between job sites throughout the day? Providing a bus to facilitate this movement and eliminating their own gas consumption each day can make your staff happier to move around frequently. Aside from making the job easier on your employees by providing transportation for certain aspects, there are quite a few benefits to you as the employer, as well. Whatever your shuttle bus needs, we’ve got you covered! For any of your transportation needs, Switzer-Carty Transportation is available to help. Whether you’re looking for transportation for a handful of staff on a seasonal basis, or something bigger for a long-term arrangement- contact us today to check out what we can do for you!